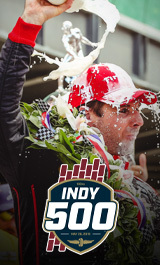 The 96th Running of the Indianapolis 500 was held on Sunday, May 27, 2012, at the Indianapolis Motor Speedway. The 2012 Indianapolis 500 marked the debut of the brand-new DW-12 chassis and the first Indy 500 following the loss of two-time Indy 500 champion Dan Wheldon. The race featured a final lap clash between Dario Franchitti and Takuma Sato that resulted in Sato crashing while exiting Turn 1.